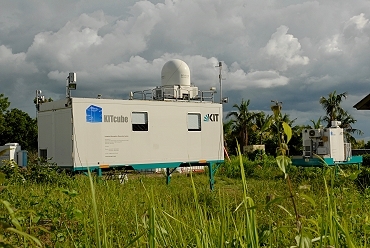 “KITcube” is the advanced integrated atmospheric observation system of the Institute of Meteorology and Climate Research, Department Troposphere (IMK-TRO). 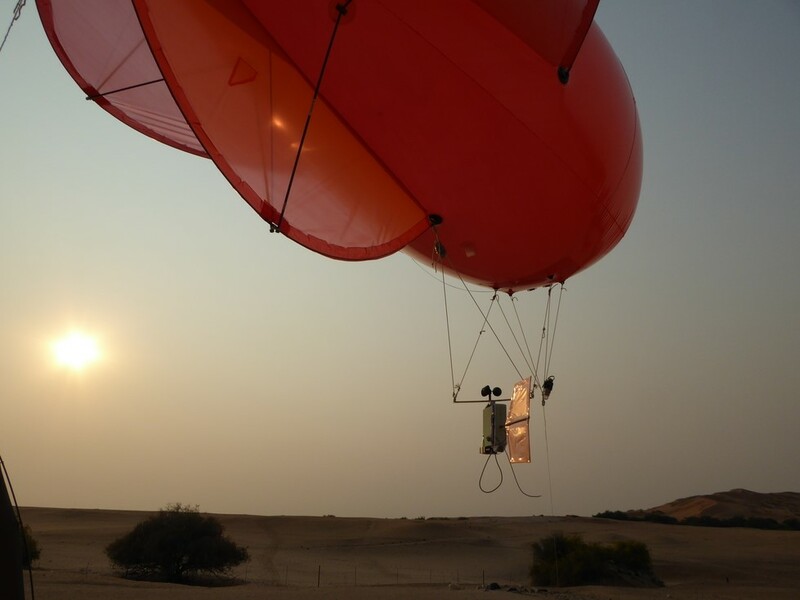 KITcube consists of a mobile facility for worldwide operation and a fixed observatory for continuous monitoring. 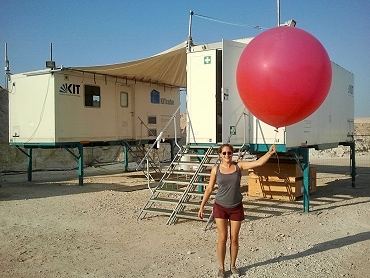 The mobile KITcube combines high resolution measurements of scanning remote sensing systems (Doppler lidars, cloud and rain radars, humidity and temperature profilers, sun photometer, sodar, scintillometer, GPS-based integrated water vapour and cloud camera systems) with classical in situ instruments on towers and balloons. Fully coordinated scans allow for studies of convection, cloud and precipitation. 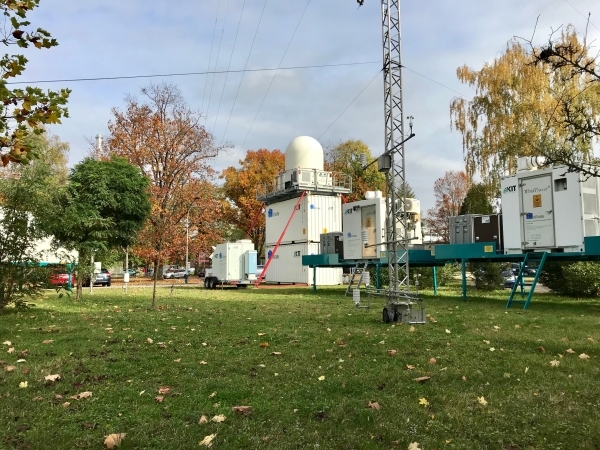 The fixed KITcube at KIT Campus North comprises the 200 m-meteorological tower in continuous operation since 1972 with turbulence resolving wind, temperature, and humidity sensors, a C-Band polarization Doppler-radar and a sun photometer. 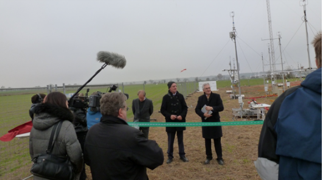 The tower was complemented with additional sensors by the German Weather Service DWD in 2016, upgrading it to an ICOS (International Carbon Observation System) anchor station. It provides a data base for climate and renewable energy studies. 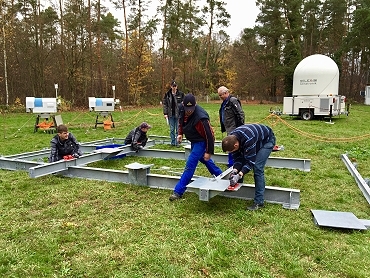 KITcube is acting as permanent AERONET-station “Karlsruhe” as well as additional temporary station during measurement campaigns e.g. at the Dead Sea or in West Africa. 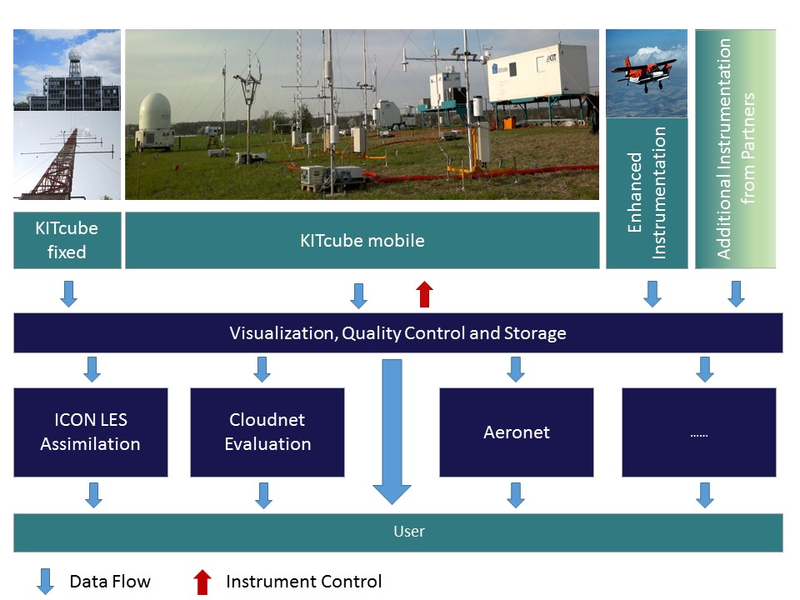 • Turbulence: By means of remote sensing systems KITcube can probe the entire boundary layer at almost the same time and can determine horizontal and vertical structures in the convective boundary layer. Thus, it is possible to survey the structure of gusts and to minimize the statistical error of turbulence measurements. • Convection: For convection studies KITcube measurements are conducted to investigate why convection is triggered in certain areas especially over complex terrain and inhomogeneous land use at a particular time and under which conditions shallow convection develops into deep convection. • Clouds & Precipitation: The formation and development of clouds and precipitation is addressed with KITcube. The instrumentation enables access to better understanding of cloud microphysical processes. Beside the temporally and spatially development of cloud structures and the resulting precipitation also mixing processes can be studied and different hydrometeors are detected. • Model evaluation and assimilation: KITcube data capture processes on different scales and allow the evaluation of different types of numerical models from Large Eddy Simulations (LES) to mesoscale prediction systems as well as retrieval algorithms such as applied within Cloudnet. KITcube data are ideally suited for assimilation into model systems such as ICON. Airborne measurements with the research Aircraft Dornier 128-6 D-IBUF of Technical University of Braunschweig are often extending KITcube measurements above complex terrain. The integration of the KITcube WindTracer WTX Doppler lidar with a motion compensating 2-axis scanner system into this aircraft is extending its measurement capacity for wind fields and profiles. 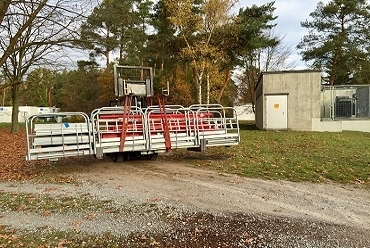 The major part of the mobile KITcube was installed in October 2017 at KIT Campus North to join the fixed KITcube during the Helmholtz ATMO Program review. During the winter period, new medium range Doppler lidars will be integrated. 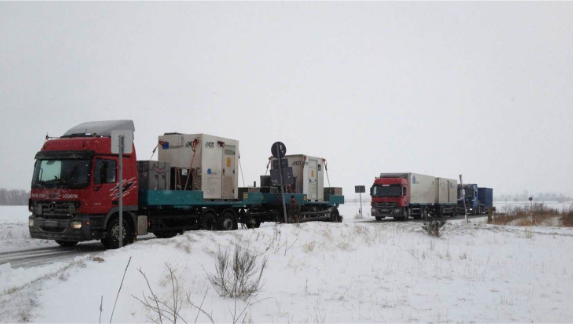 In 2018 implementation work and a test campaign for the Modular Observation Solutions for Earth Systems MOSES are scheduled for KITcube. 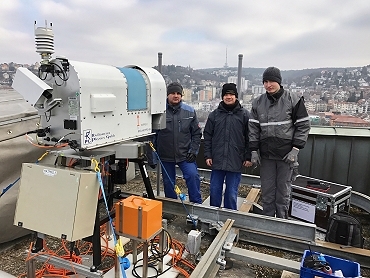 Measurements in Stuttgart within the BMBF Program Urban Climate Under Change [UC]² are ongoing in 2018. 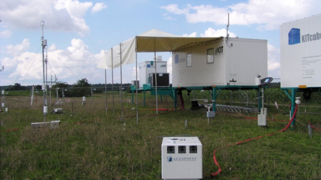 In 2017 the modular concept of the mobile KITcube was used to full capacity to conduct concurrent measurements in Namibia and Germany. For the Namib desert, one of the driest regions on Earth, fog is an important source of water and influences the spatial distribution of the flora and fauna. The knowledge about the spatial and temporal patterns of fog distribution is incomplete and, in particular, the amount of fog water deposition is unknown. 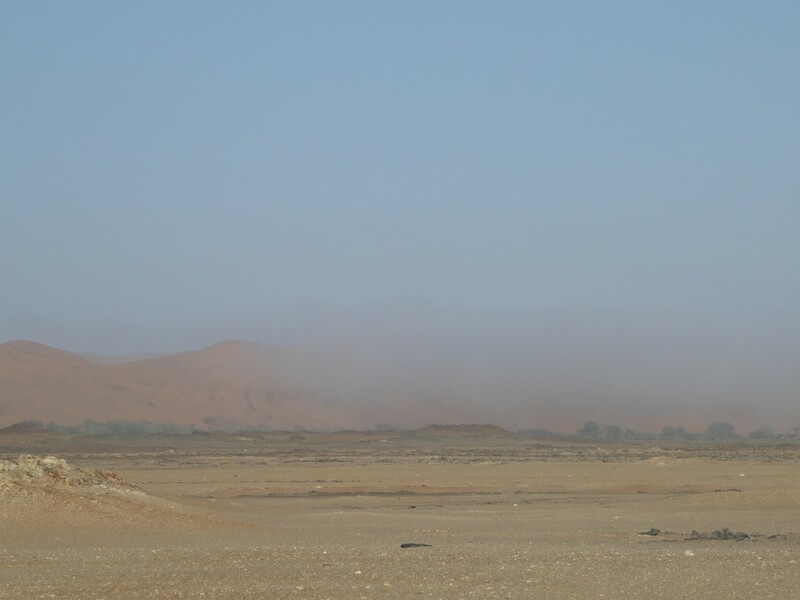 The aim of the Namib Fog Life Cycle Analysis (NaFoLiCA) is to improve the understanding of fog dynamics in the region. Parts of KITcube were operated in Namibia during September and October 2017. 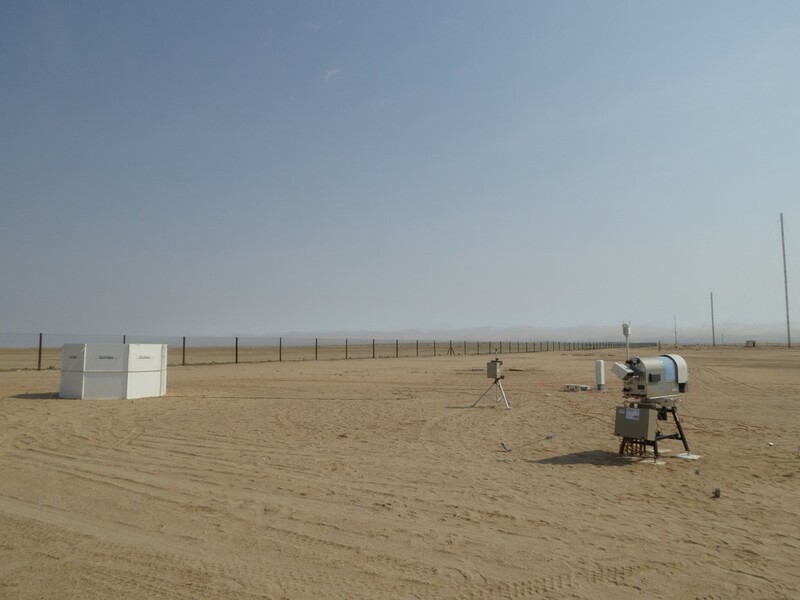 Left: A sodar (background, left), aerosol spectrometer (background, center) and microwave radiometer (foreground) providing wind, temperature, humidity and aerosol observations at Coastal Met (near Walvis Bay, about 10 km east of the Atlantic). Tethersonde ascents at the Gobabeb Research and Training Center about 55 km east of the Atlantic. The program “Urban Climate Under Change - [UC]²" aims at the development, validation and application of building-resolving urban climate models for entire cities. Within joint research projects ‚Three-dimensional Observation of Atmospheric Processes in Cities (3DO) “High-resolution urban wind fields and city-surroundings exchange processes” are investigated to improve understanding of the following items: (a) horizontal structure of intra-urban horizontal wind field patterns, (b) vertical structure of Urban Boundary Layers (UBLs), (c) superimposed secondary circulation systems, (d) exchange between the UBL and the lower free troposphere with respect to momentum, heat, humidity and atmospheric pollutants and (e) provision of respective evaluation data for urban climate models. 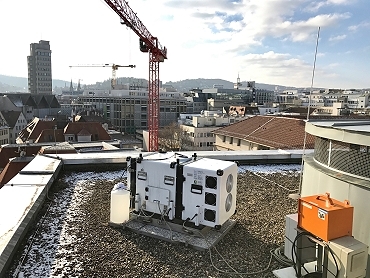 KITcube continuous measurements are taking place in the city of Stuttgart in 2017 and 2018 including 2-month duration intensive observation periods during winter and summer each year. HATPRO microwave temperature and humidity profiler (top left) and Windcube Doppler-lidar (top right) in Stuttgart city centre on top of the town hall. 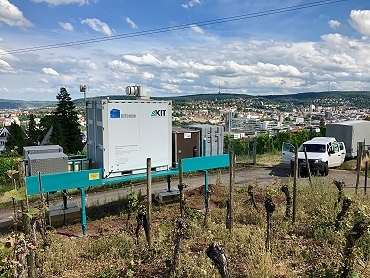 Two WindTracer Doppler lidar systems were installed in the vineyards of Stuttgart for coordinated dual Doppler operation (bottom left + right), together with the X-Band radar (bottom right) to study local flow systems, and modifications of precipitation patterns by urban areas. Wind gusts are responsible for most of the damages in cyclonic winter storms, the most destructive natural hazards over central Europe. Their forecast is challenging, because they involve multiple scales from the track and intensity of the storms down to turbulent momentum transport. Observations and forecasts are investigated here to gain an insight into the dynamics and predictability of gusts at subsynoptic scales. 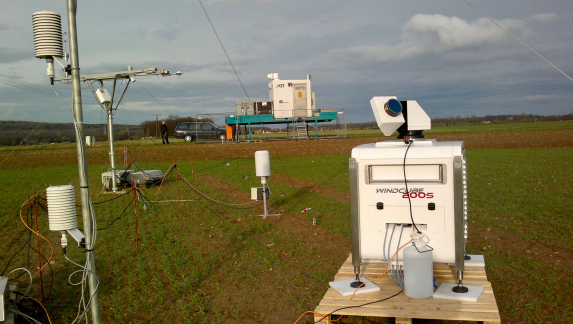 The field campaign WASTEX (Wind And STorms EXperiment) within the DFG Transregio 165 “Waves2Weather” framework was conducted during winter 2016/17 near the city of Karlsruhe. 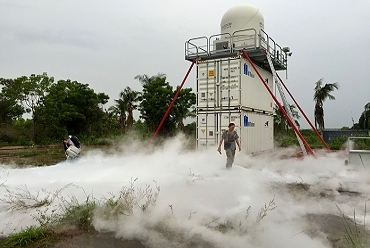 The WindTracer HYB Doppler lidar and a MFAS sodar provided high-resolution observations in space and time within a range of several km during the passage of low-pressure systems. WindTracer HYB Doppler lidar and MFAS sodar during WASTEX on top of a small hill “Energieberg” in the western part of Karlsruhe waiting for the next storm event. Goal of the interdisciplinary DACCIWA project is to investigate the influence of the rapid increase of air pollution associated with explosive population growth, urbanisation und economic growth on respiratory diseases, agriculture, and cloud and precipitation formation during the West African summer monsoon. So far, the influence of manmade pollution on weather and climate is unknown due to a lack of observations and process understanding. DACCIWA aims to close this gap by gathering invaluable data during a large field and aircraft campaign in summer 2016, which will help to improve our understanding in aerosol-chemistry-cloud-precipitation formation and its representation in weather-chemistry models. 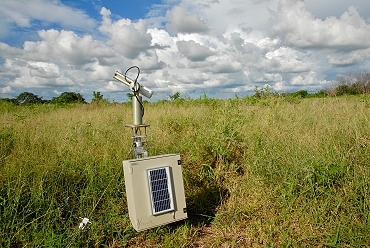 KITcube was deployed to Savè in Benin to conduct measurements during the monsoon period in June and July. The site was operated jointly together with our partners of University of Toulouse with main focus of on identification of meteorological controls on the whole process chain from the formation of nocturnal stratus clouds, via the daytime transition to convective cloud, and the formation of deep precipitating clouds. KITcube infrastructure was the base for interconnecting instruments, exchanging data and communication at the measurement site. 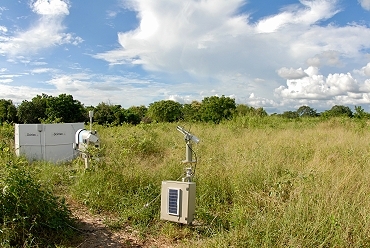 During the campaign, the first time cloud and aerosol profiles were derived from KITcube measurements applying the cloudnet program suite directly on site. We gratefully thank Ewan O’Connor! Two movies – one realized by the film teams of KIT and University of Toulouse https://www.youtube.com/watch?v=zjDrEvTmZt8 and another by Arnauld Mansat https://vimeo.com/184522021 illustrates the scientific work and logistic challenges of such a field campaign. 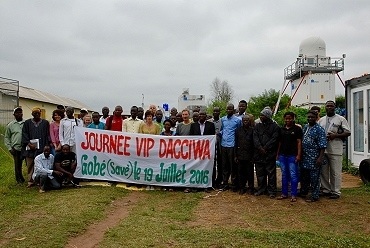 VIP day at the Savè measurement site with guest from Ministries, Research Institutions, Weather services and local administration (top left). 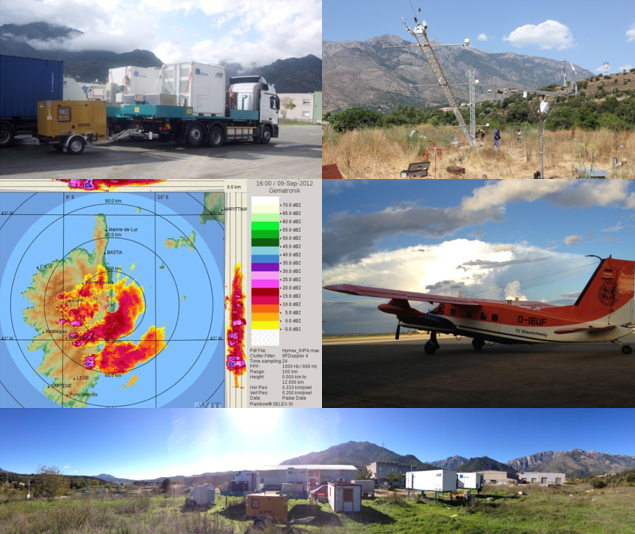 KITcube office container with connected cloud radar, X-Band radar, Doppler lidars and cloud cameras (top right), sodar, microwave profiler and Aeronet photometer (lower left) and during a flow visualization experiment next to the X-Band radar (lower right). After the return from Israel and Jordan KITcube underwent large maintenance and was prepared for the DACCIWA field campaign. 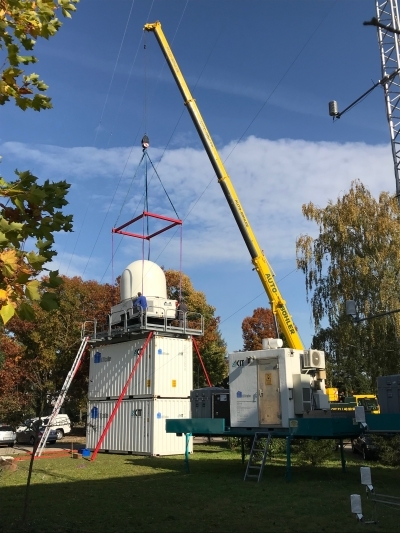 The new sectional gallery for the X-Band radar operation on top of a container tower was delivered and tested, the new Cimel polarizing photometer was integrated into the data acquisition and Aeronet. 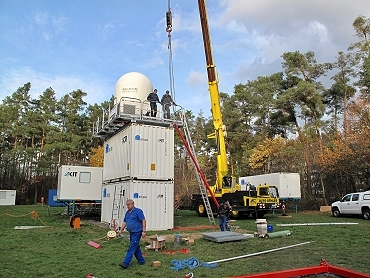 Several instruments were equipped and connected to the KITcube central data acquisition and control system by wireless links instead of cabled connections to reduce installation work in the field. Delivery and installation of the new sectional gallery for the X-Band radar operation on top of a container tower. New Cimel polarizing sun photometer (lower right). The Dead Sea region faces big water-related challenges. Among them are sea level decline, desertification, flash floods, ascending brines polluting freshwater, sinkhole development, and the repeated occurrence of earthquakes. Climate change and extensive exploitation of groundwater and surface water even aggravate the situation. These challenges can only be mastered in an interdisciplinary research effort involving all riparian countries. DESERVE and is designed as a cross-disciplinary and cooperative international project of the Helmholtz Centers KIT, GFZ, and UFZ with well-established partners of the riparian countries. 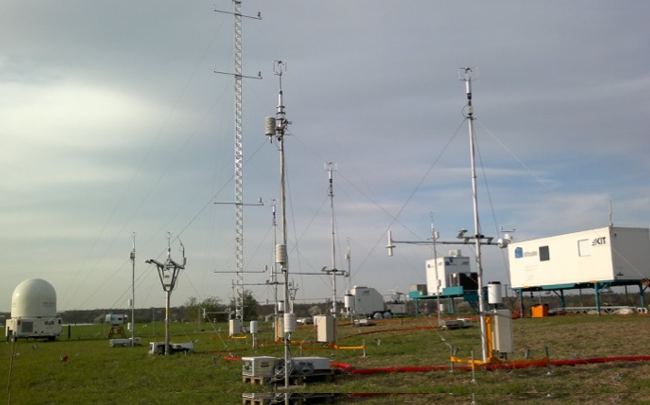 Within DESERVE, the research of IMK-TRO focuses on the operation of a long-term meteorological monitoring network with several meteorological stations in combination with intensive special observation periods with KITcube, and numerical modelling. 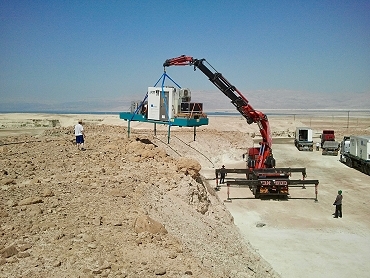 Within DESERVE KITcube was operated at a site close to MASADA, Israel with branches on the opposite side of the Dead Sea in Al Masra. 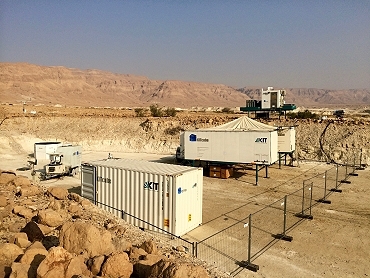 Arrival of KITcube (top left) in the Desert at Masada and installation of the WindTracer HYB Doppler lidar. Radiosonde launch and KITcube main site at Masada (lower images). The HD(CP)² Observational Prototype Experiment (HOPE) was performed in April and May 2013. 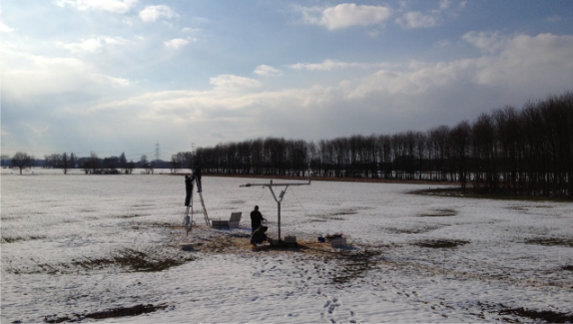 For this field campaign KITcube was installed in the vicinity of Forschungszentrum Jülich. The unique approach of the measurement campaign was the density of the measurement network: Within less than 5 km distance two other measurement systems were installed and operated the universities of Cologne and Bonn, by MPI for Meteorology as well as by TROPOS in Leipzig. Instruments at these locations were for example microwave radiometers, wind profilers as well as cloud and X-Band radars. Research goals of IMK during HOPE were on the one hand the determination of the energy balance components at the land surface, additionally considering nearby stations of the TERENO project and on the other hand the investigation of the structure of turbulence in the boundary layer. 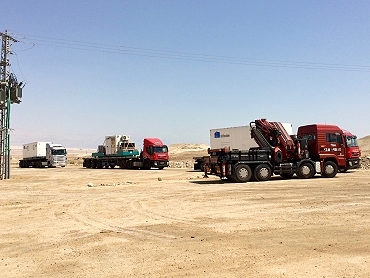 Therefore, one of the WindTracer Doppler-lidars was located about 3 km west of the main KITcube supersite together with a second energy balance station. Using Dual Doppler techniques, coherent structures were detected in the horizontal wind field. Moreover, this measurement setup allows for simultaneous observations of turbulence profiles at multiple locations. 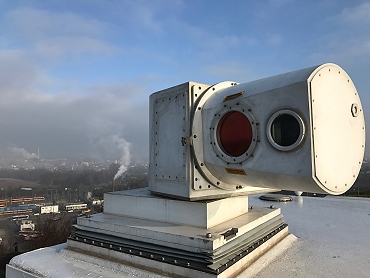 At the KITcube supersite, two additional lidar systems were installed and operated by the University of Hohenheim, measuring temperature and humidity in the boundary layer with high temporal resolution. By combining these measurements with Doppler-lidar wind measurements of KITcube, vertical profiles of turbulent fluxes can be determined. The profiles derived in this way are an important contribution for the validation of LES performed within HD(CP)². Arrival of KITcube (top left) and installation of an energy balance station (top right). 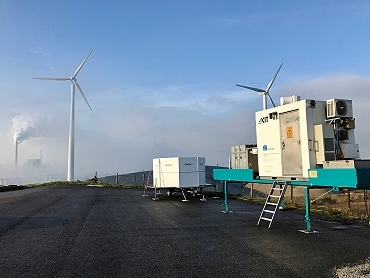 Doppler lidar WindTracer HYB and Windcube 200s at the “Wasserwerk” site next to the energy balance and turbulence tower (lower left). 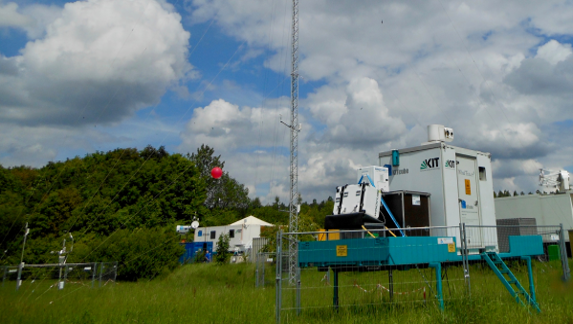 KITcube main site Hambach with HATPRO wind and temperature profiler, radiosonde station, 30m profile tower, energy balance and turbulence towers, WindTracer WTX and Windcube WLS8 and WLS7 Doppler lidars as well as water vapour DIAL of University of Hohenheim. Within the framework of the Hydrological cycle in Mediterranean Experiment (HyMeX) and the first special observation period (SOP 1) was conducted in autumn 2012 in the western Mediterranean. HyMeX aims to improve the understanding and quantification of the hydrological cycle and related processes in the Mediterranean with emphasis on high-impact weather events, inter-annual decadal variability and associated trends in the context of global warming. 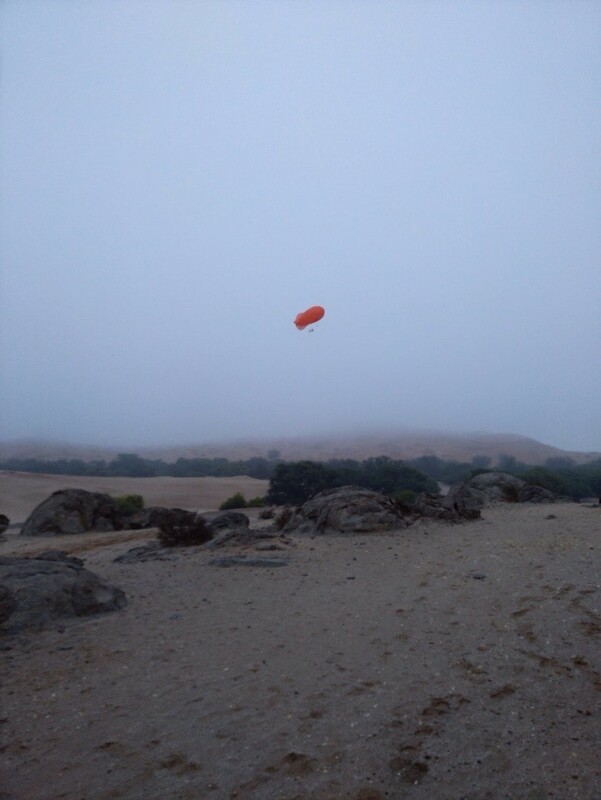 During SOP 1 KITcube was positioned at one of HyMeX's supersites on the island of Corisca. The deployment of KITcube at this position allowed to study the impact of the mountainous island on initiation and modification of isolated deep convection and provided upstream conditions for the intense precipitation events affecting continental south-eastern France and northern and central Italy. 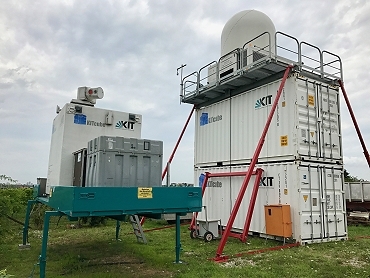 The KITcube instruments were deployed at two main sites: one at Corte in the Tavignano Valley in the center of the island and one at San Giuliano on the east coast. Arrival of KITcube at Corté site in central Corsica (top left) and installation of the 24 m profile tower (top left). X-Band measurements during a thunderstorm event (middle left) and reseach aircraft Dornier 128 D-IBUF (middle right). Panoramic view of the KITcube site at Corté (lower image). A first set-up and measuring phase with KITcube took place between 2010 and 2011 in the palatinate village Hatzenbühl. Therby all measuring systems as well as the central data acquisition and processing were operated together the first time. This opportunity was also used to celebrate an opening ceremony with the Presidential Committee of the KIT.